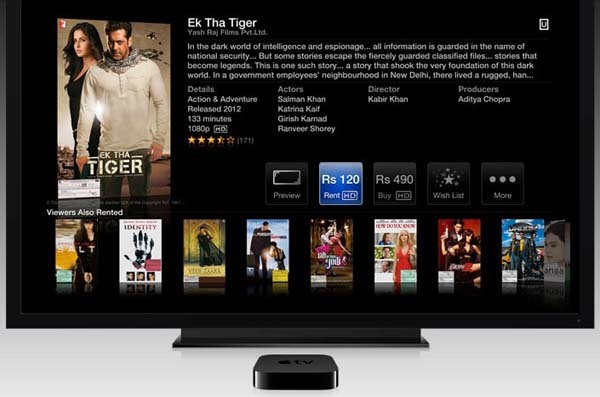 Almost a year after the device launched in the U.S., Apple has brought its newest Apple TV to India, and the company is currently looking to develop partnerships to stream content directly to TVs through the device. Apple has updated its India website accordingly and you can find the Apple TV listed under the iPod section of the site. The Apple TV, for the uninitiated, is a media streamer that lets you stream and share content from your Apple devices and from iTunes to your HDTV. The device needs to be connected to your HDTV through HDMI, while it can pull content from other Apple devices over a wireless or a wired network. Apart from content you already own, you can also use the Apple TV to purchase content from the Indian iTunes store and view it on your TV. Apple TV also provides access to a limited section of streaming content outside of the iTunes store but since most of the content is around Baseball and international finance, it’s not really something that will become really popular. Apart from music and videos, you can also use the Apple TV to view photos from your iPhone or iPad or those hosted on iCloud, mirror content (like games) from your iPhone/iPod or iPad to your TV using AirPlay and watch videos from sites like YouTube and Vimeo. An Apple India representative stated that the company was looking at partnering with Indian content providers to stream content using Apple TV, similar to the way American users can access video streaming services like Netflix and Hulu Plus on their TVs through the device. However, there were no specific details available right now. There are already a bunch of HD media players available in the Indian market such as the WD Live HD, Asus O! Play Mini and the Amkette Flash TV HD. These media players let you stream content from external hard drives to your TV. However, the media player segment is yet to breakthrough in terms of mass adoption. It will be interesting to see whether Apple, with its new found interest in India, will be able to drive up sales of the Apple TV.